Piedmont & Northern Railroad built this depot – a combination passenger station and freight warehouse – in 1913 in downtown Greer. 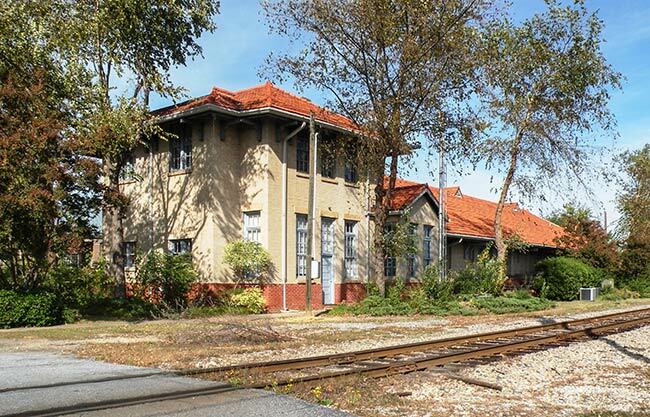 It was designed by North Carolina-based architect, Charles Christian Hook, and is the only remaining example, out of five, of a two-story depot built for Piedmont & Northern Railroad. At one time, Greer had multiple track lines for the Southern Railroad, the Greenville Railroad, and the Spartanburg & Asheville Railroad. The city also had three depots for a period of time, but the depot pictured here is the only one that still stands. The two-story portion of the structure housed the passenger station on the bottom floor. The adjacent one-story portion was originally the railroad warehouse. Greer City Hall operated out of the second level until the 1930s, and records were stored there until the 1950s. For a long time, the building was shuttered and unused. Today the depot has become a sort of strip mall where businesses operate out of different sections of the structure. While it may not serve its original purpose, the current use ensures the building remains a part of the landscape for future generations. (Piedmont & Northern Railroad Depot) The Greer Depot was designed by Charles Christian Hook of Charlotte, North Carolina, and was constructed ca. 1913 as a combination passenger station and freight warehouse for the Piedmont and Northern Railway. The depot and rail line were instrumental in helping service both the rapidly increasing population and manufacturing needs of the area. The growth in Greer and in upper South Carolina was primarily the result of the establishment of several textile mills in the area from the 1890s to the 1920s. The depot was also significant as the center of local government since the second story room was the Greer City Hall until the 1930s. 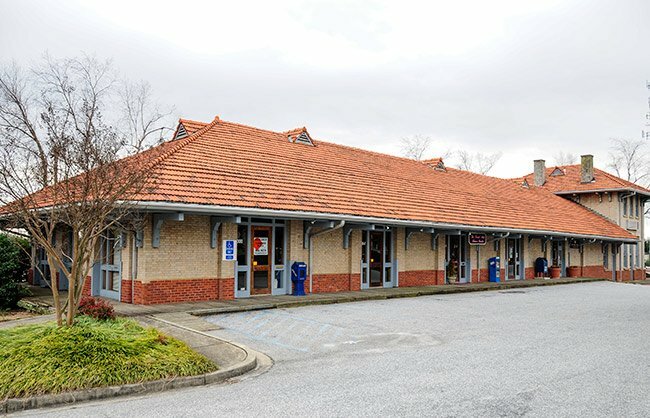 The building is architecturally unique in Greer both in style and as the last surviving railroad depot of the five original two-story depots built for the Piedmont and Northern Railway. The depot is a masonry building which combines a one-story warehouse and a two-story station. The yellow brick exterior is set on top of a wider red brick base and is laid in stretcher bond. The red clay tile hip roof is supported by a heavy wood truss and timber plank system. Two brick chimneys are placed on the east roof slope of the station section. Cross gable attic vents are evenly spaced along the roof ridge of the warehouse section. The nine warehouse bays utilize six flexible gates and three sliding dock doors. The south elevation features a projecting stationmaster’s bay between the passenger rooms and the warehouse, with a view of the railroad track in both directions. Listed in the National Register March 6, 1987.